Allegra Boverman/Gloucester Daily Times. 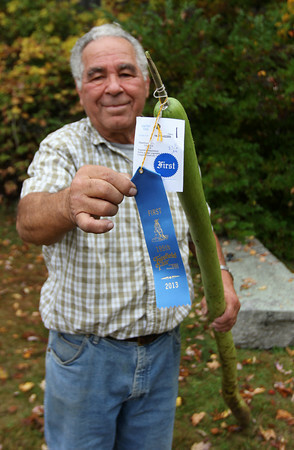 Giuseppe Tocco of Gloucester with his first place at the Topsfield Fair for his 83 1/2 inch long Italian squash he grew and submitted there. His first place was in the vegetable department's home garden vegetables category for largest gourd. He actually grew two of identical length.